(CNN) -- Briton Mark Cavendish claimed his second stage victory in this year's Giro d'Italia after once again proving he is the fastest man in the peloton by taking the 214km 11th leg from from Turin to Arenzano. Cavendish again proves he is the fastest man in the peloton with victory in the 11th stage of the Giro. Cavendish, was again superbly led-out by Columbia team-mate Mark Renshaw, to sprint clear of American Tyler Farrar, with Italian Alessandro Petacchi back in third. 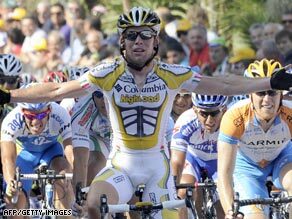 The victory also continued Columbia's remarkable Giro, with Cavendish's win meaning they have snapped up five stages already, with Cavendish and Swede Thomas Lovkvist also wearing the race leader's pink jersey as well. Current pink jersey wearer Danilo Di Luca, the race winner in 2007, finished in the peloton to retain the overall lead he strengthened after winning Tuesday's 10th stage. LPR rider Di Luca holds a lead of one minute and 20 seconds over Russian Denis Menchov, with Australian Michael Rogers, another Columbia rider, a further 13 seconds behind in third overall. However, the overall classification is likely to shake-up again on Thursday with a marathon 61km time-trial from Sestri Levante to Riomaggiore likely to sting the legs of any rider not feeling in top form. On a hot and sunny day, Vladimir Isaichev broke away with 110km to run as he went looking for his first-ever professional stage win. The Xacobeo-Galicia rider opened up his biggest lead of more than seven minutes with 45km to run before the peloton took matters into hand and began to reel him in. A group of 30 riders broke away from the main bunch as the stage hit the only minor climb of the day, where Lampre's Maro Marzano attacked . The Italian closed down on Isaichev before going past the 23-year-old Russian with 15km remaining. With a mass sprint finish always on the cards, Marzano was caught as the race swung into the outer limits of Arenzano and he was finally engulfed by the peloton with just over 20km to race.